Maciste means 'from the rock.' 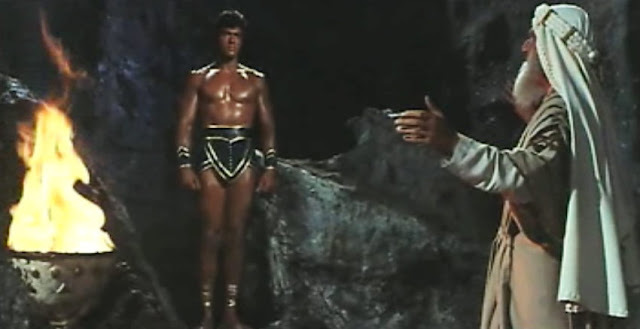 In this film, it's one of the few movie that shows Maciste appearing out from a rocky cliff. The English title, HERCULES OF THE DESERT, is silly since Hercules doesn't appear when summoned. It's the reason why I prefer a literal translation of the original Italian title. Coming soon to PEPLUM TV. one character says that he is like "Hercules"
Thanks for this first class "Arabian Nights" type Peplum (another name for this genre is "sword and sand"). The movie's substance and audio/video quality were excellent. Helene Chanel made an excellent villainess. Gianna Maria Canale, who is my favorite villainess in Roman themed Peplums, could not have done the role better. Three scenes which every "Arabian Nights" movie must have are: (1) a female slave market auction, (2) an elaborate feast with dancing girls, and (3) a torture/cell walls closing in episode. All three scenes were well executed. THe auto-generated subtitles contained quite a few errors, which show that 100 percent correct subtitles still require final human supervision.